ISTANBUL (AP) — Four female lawmakers wearing headscarves walked into Turkey's parliament in Ankara on Thursday, marking an end to the ban on the Muslim symbol in the chamber that was imposed in the early days of the Turkish Republic. Still, the issue of where women can wear headscarves remains a highly charged on this in Muslim-majority country, which was founded in 1923 under strict secular principles, but where a desire for public religious expression has spread in recent years. The restrictions on headscarves in government buildings were loosened as part of reforms aimed at boosting democracy unveiled by Prime Minister Recep Tayyip Erdogan in September. The ban remains in place for judges, prosecutors and military and security personnel. The four lawmakers — Sevde Beyazit Kacar, Gulay Samanci, Nurcan Dalbudak and Gonul Bekin Sahkulubey — are members of Erdogan's Justice and Development Party, abbreviated as AKP, which has Islamist roots and has gained a strong following in this nation of 74 million. The AKP's reform package has been criticized by Turks fearing the rise of Islam in the official sphere, but lawmakers from the main secular opposition party, CHP, said it had decided not to react to the four lawmakers' actions Thursday, although some of its members accused the ruling party of trying to exploit the issue for political gain. The CHP was formed by Turkey's founding father, Mustafa Kemal Ataturk, who championed headscarf bans in the 1920s. The secularists' relatively cool reaction Thursday contrasted with outrage at an earlier incident involving headscarves in parliament. In 1999, a newly elected member of parliament, Merve Kavakci, tried to take her oath while wearing a headscarf. The left-leaning prime minister at the time, Bulent Ecevit, told lawmakers to "put this woman in her place." Kavakci left the building while some of her colleagues chanted for her to "get out." Kavakci lost her seat in 2001. 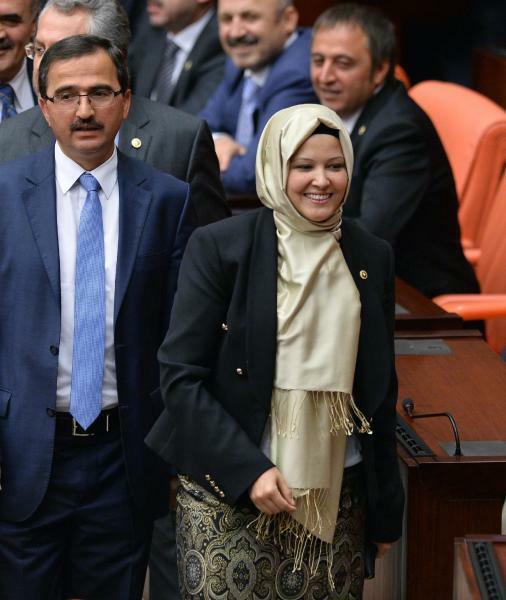 AKP lawmakers cast the ban on headscarves as a civil rights issue that had prevented religious women from expressing themselves freely in Turkish politics. "I have always said that we overlooked the problem of equality between men and women, but today I think we are finally solving this problem," said Oznur Calik, a member of the ruling party. What women can wear has been a political battleground in both Muslim and non-Muslim countries. Women are required to cover their hair in public in Iran, which is overwhelmingly Muslim, a rule many of them detest. France, meanwhile, in 2011 became the first European nation to ban the public use of face veils, infuriating many Muslims who felt their religious community was being singled out for discrimination.